In a workshop in Hue, Vietnam, two rows of women are intent on their work. Fine, brightly-coloured thread and embroidery needles fly through the lustrous silk, as patterns of flowers and swirls come to life. Even as they concentrate, the women have time to talk and laugh in the well-lit workspace. It is a world away from their small, traditional homes, where many of these women live in poverty. This is Vinh Hoa, a social enterprise in Hue, which has taken the rich embroidery and silkwork traditions of Vietnam’s ancient cultural capital, and used them to train and employ women who might otherwise have no way to find steady, safe, fair employment. 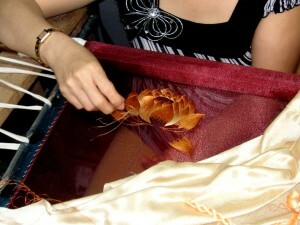 Many of Vinh Hoa’s staff can’t do fine embroidery work in their homes. A lack of electricity means the dim lighting weakens their eyesight badly. After 2-3 years working in such conditions, Vinh Hoa staff told us, the women’s eyes can be so damaged that they can’t continue embroidering at all. In the workshop, though, Vinh Hoa has set up workbenches with bright down-lighting, protecting the workers’ eyes, giving them a social meeting point, and ensuring a longer, brighter future as skilled artisans! Crossroads’ Global Handicrafts shop is dedicated to promoting and selling fair trade products from all over the world, like homewares, gifts, clothes, toys and the scarves made by the women at Vinh Hoa.